Spells-matter decks perform admirably these days, but my favorite Human Insect rarely inhabits them. Last week, I mused about what Delver of Secrets would need—both card-wise and metagame-wise—to again be a player in Modern. Those thought experiments inspired deckbuilding experments, which Wizards detonated with an exciting spoiler. Today’s article unveils the findings of my aberrant research. Delver has many shortcomings in Modern, but also some potential uses. I believe that the reason to play Delver over the more proactive and explosive Arclight Phoenix decks is its ability to incorporate stack interaction, which punishes spell-based combo decks but suffers against midrange. Relying on a more “fair” threat also enables Delver to run hate cards that cripple Phoenix and other velocity-centric packages (i.e. Damping Sphere); relatedly, Delver of Secrets itself dodges the most common Phoenix hate (i.e. Surgical Extraction). With this deckbuilding slant, Phoenix itself ends up being a positive matchup for Delver, as does the top-performing deck in Modern, Ironworks. From there, I had to determine cantrip numbers, flesh out the creature base, and decide on disruption. Delver all but demands some cantrip density, and Modern’s not known for its selection of powerful blue cantrips. Ponder is probably the best at setting up flips, but it’s banned in Modern; I’d say Serum Visions takes the number two slot, and also excels at finding key cards. Up next are Sleight of Hand, Opt, and Thought Scour. As we’re often operating at instant speed, Opt looks a lot better than the marginally-more-impactful Sleight of Hand, since it lets players hold up permission mana. Scour, too, is an instant-speed cantrip, and has the potential to be the best of the bunch. Grixis Shadow’s dip into Faithless Looting and Mishra’s Bauble has claimed some copies of Serum Visions, but Scour always remains a 4-of in that deck due to its ability to power out delve threats. I wanted my Delver deck to also have the ability to abuse Thought Scour, ideally enough to make it better than Serum Visions—in doing so, I’d upgrade the power level of my cantrips generally. I also included a pair of Faithless Looting to see how the card played in this deck, anticipating that land drops beyond the third would prove superfluous in pretty much every game 1. I ended up having to raise my land count to from 18 to 19 to support later card choices, a decision Looting helps grapple with in the mid-game. While I wanted a set of Scours, I also didn’t want to build the deck in such a way that it would fold to heavy-duty graveyard hate, especially Rest in Peace. That’s a problem with Temur (reliant on Tarmogoyf and Hooting Mandrills) that I think makes the deck utterly unplayable in this graveyard-wise metagame. The question when choosing threats was one of how to extract value from a full set of Scours without opening myself to blowouts from hate cards. Tarmogoyf, Bedlam Reveler, and delve threats do absolutely nothing against a resolved Rest in Peace. Goyf is the worst offender here, as a later Rest invalidates any previously resolved Goyfs, while the other creatures lock in their value when cast. Crackling Drake met my criteria perfectly—on top of that, no Scour is ever too many for this creature; it always improves. But four mana is a steep cost for a core threat in a Delver deck, no matter how reactive the build. I ended up settling on Grim Lavamancer. The four Scours ensure a constant stream of cards entering the graveyard, allowing Lavamancer to totally dominate the small creature matchups Delver has long splashed sideboard sweepers to beat. Its floor is much higher than Goyf’s, for instance, as a one-mana 1/1 considerably trumps an off-color, two-mana 0/1. Finally, Lavamancer makes up for his lack of offensive power by letting us run 4 Wizard’s Lightning comfortably. The instant adds oomph to our Bolt-Snap-Bolt plan and gives us additional ways to power through board-invalidating tech like Ensnaring Bridge and Terminus. To further compensate for Lavamancer’s disappointing red zone abilities, I rounded things out with a pair of Vendilion Cliques. These are also Wizards that support the Lightning package. Clique gives UR a unique form of interaction by disrupting the hand, as well as a respectable aerial clock deployable at instant speed. But it is slow and vulnerable to most removal spells, including the now-ubiquitous Gut Shot. 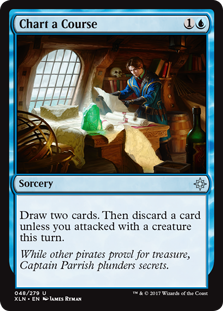 Just as my methods for selecting creatures and cantrips were heavily influenced by a desire to play Thought Scour, the decisions taken regarding permission focused around another one-mana blue instant: Spell Pierce. I’m of the opinion that Spell Pierce is bonkers in Modern right now, just as it has been in Legacy for years. Naturally, Pierce shines against spell-based decks with combo elements. Hitting these decks where it hurts means taking out their consistency tools, which Pierce does with considerable reliability. But looking past its obvious prey, like Manamorphose and Ironworks, Pierce claims palatable applications against even decks that don’t “go off.” No longer can Spirits Path to Exile our early Lavamancer, or swarm the board with Collected Company. Terminus is a hassle for creature decks, but much less so when its pilots cast Cryptic Command and Jace, the Mind Sculptor into a one-mana counterspell. The key to Pierce’s power is the tempo it tends to generate. Hitting expensive spells provides Delver with a mana advantage. Few spells in Modern are free, so at one mana, Pierce almost always trades at mana parity or better. And Modern’s one-mana cards don’t feel bad to hit because they’re also some of its best. In this metagame, permission in general—though especially the one-mana Pierce—is poised to procure more than just tempo. Cards like Tormenting Voice and Collective Brutality ask pilots to two-for-one themselves before resolving their spell, and decks such as Storm and Phoenix use rituals and pricey cantrips to generate chains of spells. Disrupting these chains can leave opponents low on resources. I went with 3 Pierce to avoid clogging in mid-game scenarios, and added a pair of each Spell Snare and Mana Leak for whatever else might present itself. While it’s not permission, I also threw in a pair of Abrades for good measure; I like to have at least six removal spells in my Delver mainboards, and was interested in discovering what mainboard artifact hate can do for the archetype. So concludes our slow-mo replay of the building process for a list that took me five minutes to type up. The deck performed better than I expected it to. Lavamancer is a house in some matchups and gave me lots of free wins. Abrade also seemed fine in the mainboard. Just a couple days into building and tweaking the above list, Wizards spoiled Pteramander, a Flying Men that, under perfect conditions, could serve as an on-color Tombstalker. But Pteramander differs from Stalker in a few ways. Split costs. While Tombstalker can use any cards in the graveyard as fuel, including dead creatures and fetchlands, Pteramander gives players a layaway option: we can cast the “front half” for just one mana and grow it for the difference at instant speed. Delve vs. check. Similarly, although Stalker puts a 5/5 flier on the board faster, it cannibalizes other copies of itself. Pteramanders can all be grown at the same time, allowing us to run enough to make it a primary threat for the deck. CMC. Pteramander‘s low converted mana cost makes it vulnerable to Fatal Push and Abrupt Decay. Its low investment cost somewhat compensates; having Tombstalker removed is generally more backbreaking. As I’d been working hard on UR Delver already, Pteramander prompted a sudden change of course. Like Lavamancer, Pteramander makes great use of Scour without becoming useless under Rest in Peace—it’s even better under Rest than Lavamancer, since it flies. Pteramander is also more robust than Lavamancer; once its condition has been met, it’s difficult to kill even a fresh one with Lightning Bolt. Pilots can simply deploy Pteramander, activate it, and then activate it again in response to damage-based removal. Alternatively, they can hold up mana until the following turn cycle to represent adapt. I rebuilt the deck from scratch in another five minutes, landing on a list almost identical to the UR Lavamancer one. In place of Wizard’s Lightning, I added a smattering of random instants and sorceries that underperformed during initial tests. Then, I realized another of Pteramander‘s components: it’s blue! That means the creature helps enable Disrupting Shoal, which I have again been pining after in this metagame of blazing-fast kills created by cheap spells. Shoal also does a fine job of protecting Pteramander from the likes of Fatal Push: at the stage of the game where Pteramander “flips,” it’s often trivial to hold up hard-Shoal mana, and Cancel is as strong as ever with a beater on the table. A couple days of fitting pieces together led me here. I added 4 Opt to help with Pteramander. One land was trimmed to account for the Opts and the omission of Looting. The manabase was overhauled to be less painful without Lavamancer around to eat fetchlands. The sideboard became more streamlined and focused. Some more obvious changes were also made to account for a recurring UR failure point. While UR Lavamancer could happily burn opponents out if they stuck a huge Knight of the Reliquary or Tarmogoyf, the Pteramander build struggles more with opposing fatties. I therefore split Abrade with Dismember in the mainboard, and added Echoing Truth where I once had the 19th land. Truth is a catch-all temporary answer to whatever permanent opponents stick, and I’ve liked it so far. It also sometimes exceeds its on-paper worth by dealing with a horde of tokens. Crackling Drake also shows its face in the mainboard for this purpose: it’s always bigger than whatever opponents can muster. Our many cantrips help us resolve it game 1, though multiple copies can clunk. Same deal with multiple Vendilion Cliques, as the Faerie’s a legend, so I took one out for the Drake. Clique and Drake also give us the lottery-esque ability to Shoal three- and four-drops for huge tempo swings, although it rarely comes up. Pteramander tends to adapt for one mana around turn four. It’s also flippable early if pilots are willing to take a turn off and sink mana into the ability. In the meantime, the creature asks very little of the pilot, and even makes itself useful around the battlefield; I’ve gladly used early Pteramanders to trade with small fliers in combat. When games are due to go longer, either because we assume a more interactive role against creature decks or because midrange opponents assume that role against us, Pteramander consistently takes over the mid- and late-game. The creature’s worse against combo-oriented decks like Phoenix, Ironworks, and even Tron and Burn. In these matchups, it takes too long to grow and is usually sided out for hate. Fortunately, Delver (not to mention this build) is already well-equipped to defeat these sorts of decks, so a potential game 1 loss isn’t the end of the world. Salamander is also soft to Rest in Peace, and gets swapped for Drake against opponents likely to bring in multiple copies of the enchantment. Since Rest decks tend to be slower, casting multiple Drakes on just 18 lands is feasible in those matchups. Relative to the Lavamancer build, the Pteramander build offered fewer free wins, but a more consistent playstyle across the board. This deck is always built to grow Pteramander, but opposing decks are not always built to lose to Lavamancer. This improvement in consistency gives me hope that the Pteramander build can survive in Modern should it prove simple enough to enable. On that note, it helps that Pteramander need only be enabled in game 1. Once opponents have access to their hate, it’s simple for Delver pilots to pivot towards Crackling Drake and blank the hosers, additionally benefitting from opponents spending cards and mana interacting with a resource we no longer rely on. This sort of swap was tougher to do with Lavamancer, since cutting the Wizard left behind a bunch of unpowered Wizard’s Lightnings to deal with; Pteramander then improves our reversibility during a match. There’s still plenty of ground for Pteramander to cover. I didn’t test it alongside Chart a Course, for instance, because I felt I had plenty of cards thanks to Snapcaster; perhaps trimming the Wizard for some number of the sorcery functions better in this shell. Pteramander may also have applications alongside Arclight Phoenix, with which it doesn’t clash (although both cards utilize the same resource). How are you planning to use the little guy? As always, share your thoughts in the comments, and happy spoiler season! Edit, sorry, you have spell snare. In the Lavamancer build, yes. Shoal encroaches on Snare’s territory in the Salamander deck. I did not get the meaning behind this sentence : ” Pilots can simply deploy Pteramander, activate it, and then activate it again in response to damage-based removal.